The OMICS group is still trolling for scientists to join their high-quality events. 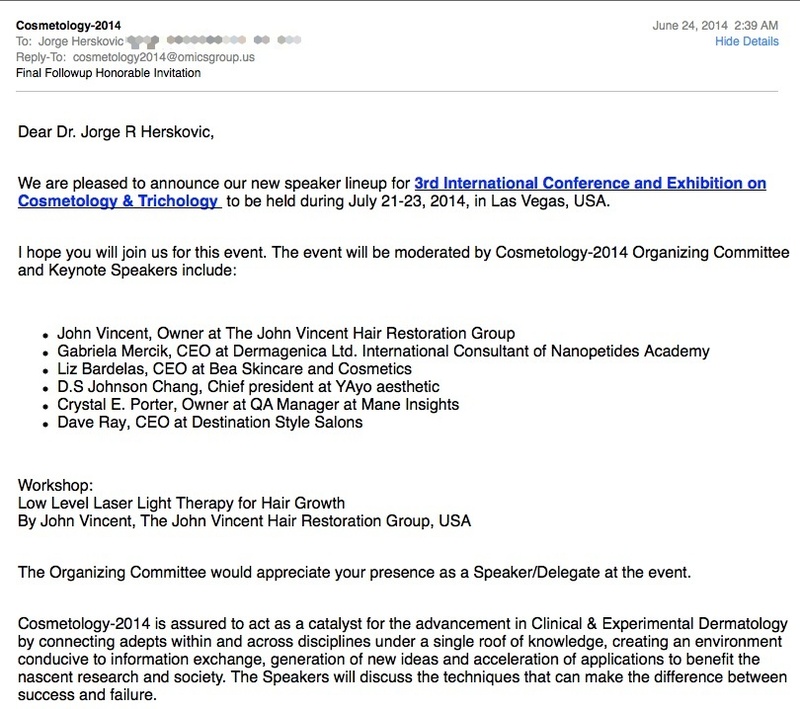 The latest is an invitation to Cosmetology 2014, a “Dermatology” conference where all of the speakers are cosmetics and hair salon CEOs. I’m sure I could come speak to them. After all, they probably want to hear me talk about academic metrics, clinical data warehousing, or the applications of graph theory to natural language processing in clinical text. 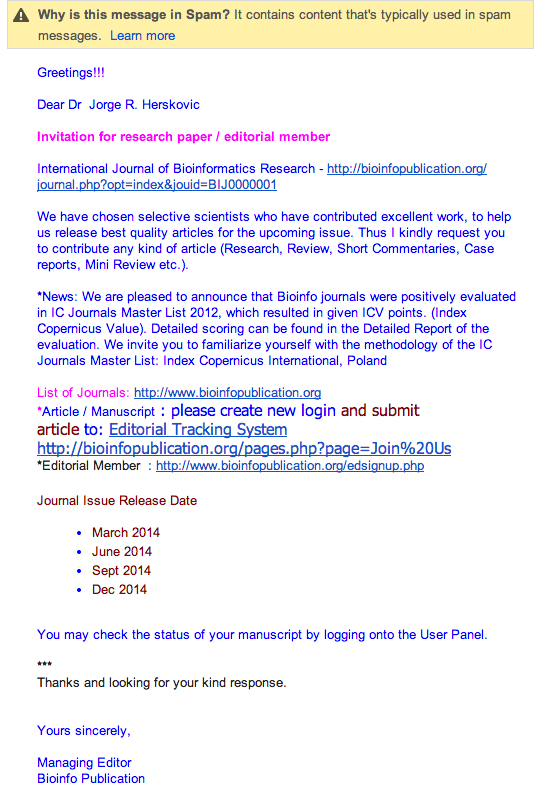 The predatory publishers on Beall’s List keep looking for scientists to spam. 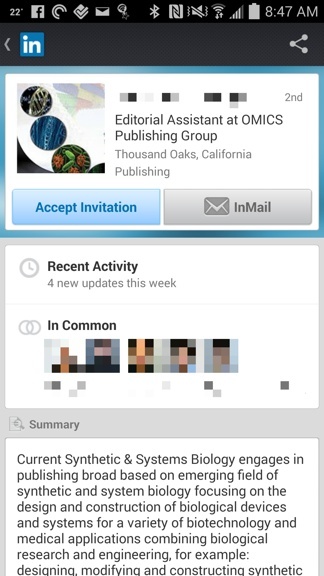 The newest tactic is a beauty – just connect to people on LinkedIn. I got the request this morning. I took a screenshot from my phone. 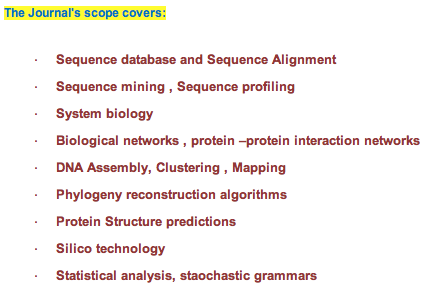 Yes, “OMICS Publishing Group” is featured on Beall’s List. They send me a lot of spam. As you can see by the non-empty “InCommon” field, several of my dear colleagues already fell for this. Always check Beall’s List before interacting with scientific publishers. In today’s world, it’s sad but necessary. I can honestly say that I’ve never thought of myself as a flower. Perhaps that’s why an invitation to join the editorial board of a journal in “the bouquet of STM JOURNALS” [sic] doesn’t really speak to me. No mention whatsoever of the fact that these are Open Access journals. I’m sure it was just an innocent omission. A journal with a scope so broad as to be nonsensical (and with misspelled terms, to boot). See below. Of course, these aren’t my areas of expertise. I’ve never published in any of these. That’s no problem, though: I’m invited to peruse the (no doubt) fragrant bouquet of journals and settle on one, buzzy bee that I am. Wait, I thought I was a flower. You, too, can be a published scientist! Straight from my gmail spam folder, the other side of the coin: solicitations for publications. Now that’s an enthusiastic Greetings!!! usually reserved for people promising me miracle drugs. Nigerian barristers tend to be more somber, which is reasonable given that they are usually informing me of the passing of previously unheard of (but very dear, and very illegitimately rich) relatives. I sure am glad I am one of the “selective scientists” they have chosen! I don’t think they’ll consider this post “excellent work,” but whaddareyagonnado. Jeffrey Beall maintains a list of what he kindly calls “Potential, possible, or probable predatory scholarly open-access publishers” at Beall’s list. If you are considering submitting work to a journal or publisher you haven’t heard of before, you should use his list as a starting point and do some research on your potential publisher. Unsurprinsingly, today’s correspondents are on his list. You, too, can be an editor! Part of being a scientist is curating the work of other scientists. This is called peer review. Peer review is critical to the well-being of science, because it helps ensure that the scientific record is important, correct, and has passed some level of validation before being put in front of other people. Peer review is unpaid, tedious work. Most Universities know that their faculty will spend some time performing peer review. Official institutional CVs and promotion paperwork therefore have space for review activities, so that you can show you’re contributing to the larger scientific community. It also makes you feel like a good citizen, which it should, since no one will ever thank you for it. A step above this (and a major time sink) is the -still unpaid- position of editor of a scientific journal. A good editor knows his or her field well, has plenty of experience in the peer review trenches, and performs invaluable service to the scientific community. Being the editor of a scientific journal, or part of the editorial board, brings some academic bragging rights. It is also somewhat expected (implicitly, of course; no one will ever say this) that your friends and colleagues will want to publish their stuff in your journal. Whether it’s because of the expectation of better service, faster reviews, helping a buddy out, or perhaps a less careful look at the flaws of the science in a paper, is not normally explained. This post was prompted by an email I get every few weeks. The company, journal, and sender are always different, but the content isn’t. Where, oh where should I start? Let’s begin at the bottom. You’d think that being invited to be the editor of a journal, a big honor, merits a personalized email drafted after (one imagines) much careful deliberation. I’d wager that being invited to edit Science, or Nature, or (a bit further down the ladder) our Journal of the American Medical Informatics Association gets you exactly that. No one has invited me to edit any of those, which is probably for the best. I’d be a terrible editor. 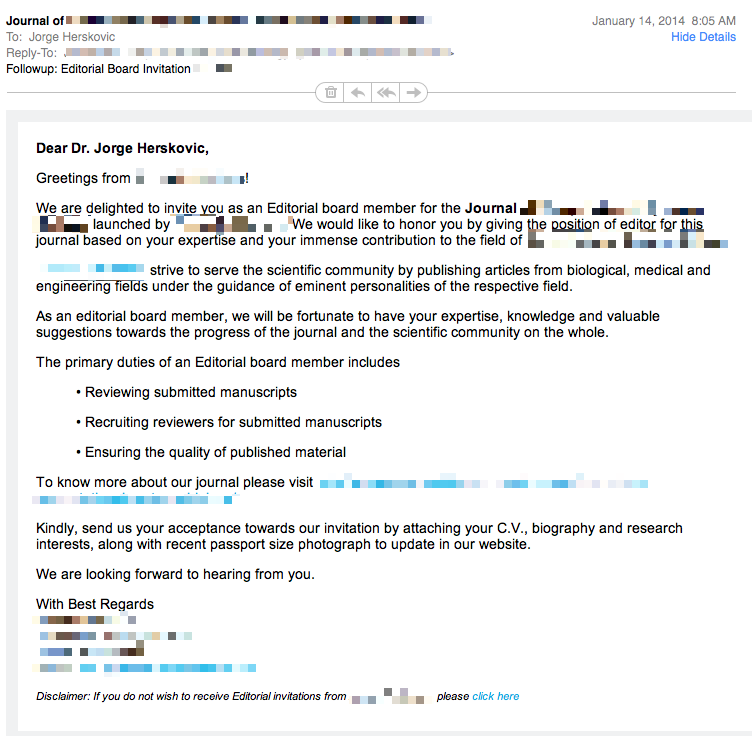 Being invited to edit this journal-that-shall-not-be-named comes via spam, with a telltale line at the end giving away that this particular “eminent personality” (me) was picked from a database, and will be invited to edit again by Mail Merge in the future. Let’s move on to the actual meat of the problem, though. I’ve never published a paper in this field. Ever. My “immense contribution” to the field is exactly ZERO. What is this, then? It is, like most spam, about money. This is an Open Access journal (fact carefully omitted from the body of the email), which means that scientists will pay publication fees if their papers pass peer review and get published. I strongly suspect that ANY paper sent to this journal will get published, based on their selectivity choosing editors. It is, then, an offer of a line for my CV (“Editor for the Journal of IMPRESSIVE_SOUNDING_NAME”) and ego service (“Immense contribution!” “Eminent personalities!”) in return for the possibility of guiding some colleague with a paper that can’t-quite-get-published to an unknown Open Access journal edited by his or her buddy. Any paper will do; note that they strive to serve “biological, medical, and engineering fields”. I suspect that a paper on weather patterns in Mars is a-ok too. I want to be absolutely clear about this: OPEN ACCESS IS A PHENOMENALLY GOOD IDEA. These clowns are polluting, distorting, and corrupting Open Access in the same way that “Barrister BENJAMIN KOFFI, A Legal Representative to late Mr.B A Herskovic” devalues email for everyone else. Not that it matters, though. As far as I can tell from its website, this journal has never published an article. Nothing in the “current issue”. Nothing in “past issues”. “Articles in press”? Empty. 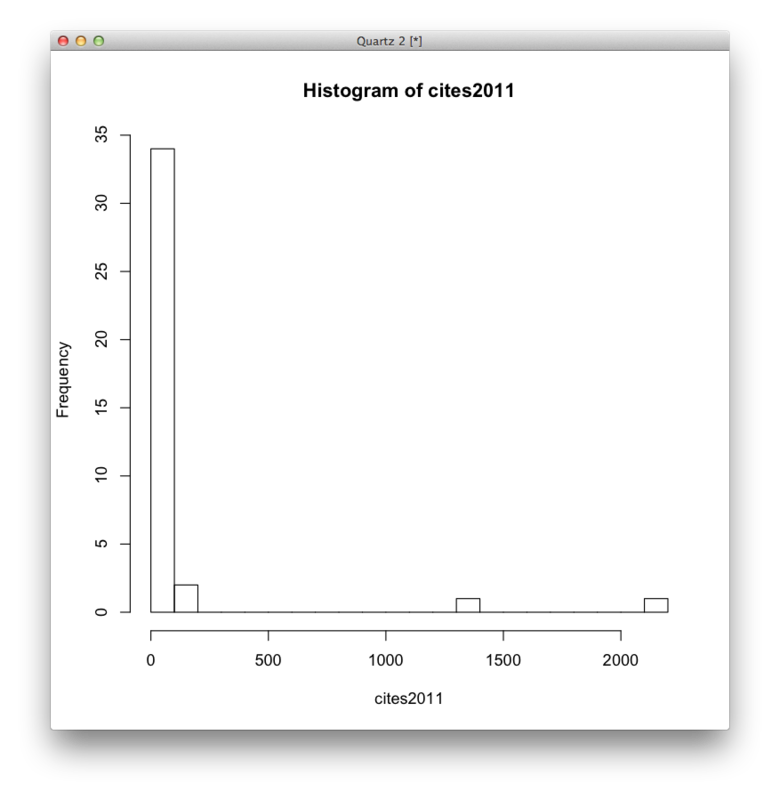 It’s not included in the Journal Citation Reports or Scopus. Not that it should, given that it hasn’t published squat, but I checked for completeness’ sake. How many editors does this journal that, so far, publishes nothing has on its editorial board? According to its website, twenty-one. It sure seems like a lot of people to edit zero articles, but it’s the only way to get people to consider the journal and get those sweet, juicy Open Access fees flowing. Fantastic post over at Slate Star Codex on how people use statistics to cheat at science. I already gave my take on the pressures scientists face, and the culture that leads to it. I wish I had written that post, or its linked articles. Go read. We scientists publish only positive results. There’s a lot of reasons for this, some more valid than others. The first one is that it’s hard to prove things beyond a shadow of a doubt (Popper, stop spinning in your grave). Formally, you can disprove things. If we ever witnessed, and recorded, an apple that failed to fall from a tree and just hovered there, we’d have a tremendous challenge to our understanding of gravity. We can accumulate evidence for things, and a lot of what we do is precisely that. But we can’t prove things as a mathematician can. This leads to strangeness when science meets the real world. Witness the debate about whether evolution is “just a theory,” which is entirely predicated on a profound misunderstanding on how science works. When you run an experiment and you don’t get results there are many things that can explain that. Perhaps your data was bad. Perhaps one of your assumptions was wrong. Perhaps you were unaware that you were making assumptions in the first place. Say that, for some reason, I run a double-blind, randomly-controlled, properly-powered (i.e. with enough samples), long-enough, well-sampled (lots of brands) experiment to see if people who drink tap water get less cancer than people who drink bottled water. I have no idea why this could be the case, since I just made it up, but bear with me. Now imagine that I discover that the rate of cancer among people who drink tap water is 25% of the rate of cancer among people who drink bottled water, p<0.00001 and all that. It survives peer review and gets published in a major journal. The media will probably be all over it. You won’t care why, and you won’t care how, but you’re damn sure switching the people you care about to drinking tap water from now on. Eventually, someone will discover which ingredient in bottles is dissolving in the water, and how it affects human DNA, and so on. There will be entire scientific careers, many papers, and perhaps a few conferences on why and how this happens. But the fact itself that tap water is safer (or that bottled water caused cancer) is important, right here, right now. Now picture the much more likely scenario in which I perform the same experiment, and find that absolutely nothing happens. What does it mean? Does it mean that bottled water is just as safe, cancer-wise, as tap water? Maybe. Is this unexpected? No. Most sane people fully expect tap water and bottled water to be just as safe as each other. The experiment, and its result, add very little in the way of new information to the world. This makes them less valuable. There’s also the problem that I could’ve simply missed something. Perhaps my sample missed a brand with a radioactive bottle (Nuka-Cola?) and no one noticed, because the team never heard of it. When you get a positive result, there’s something there to dissect, analyze, and learn from. When you get a negative result, something isn’t there. You failed to catch it. 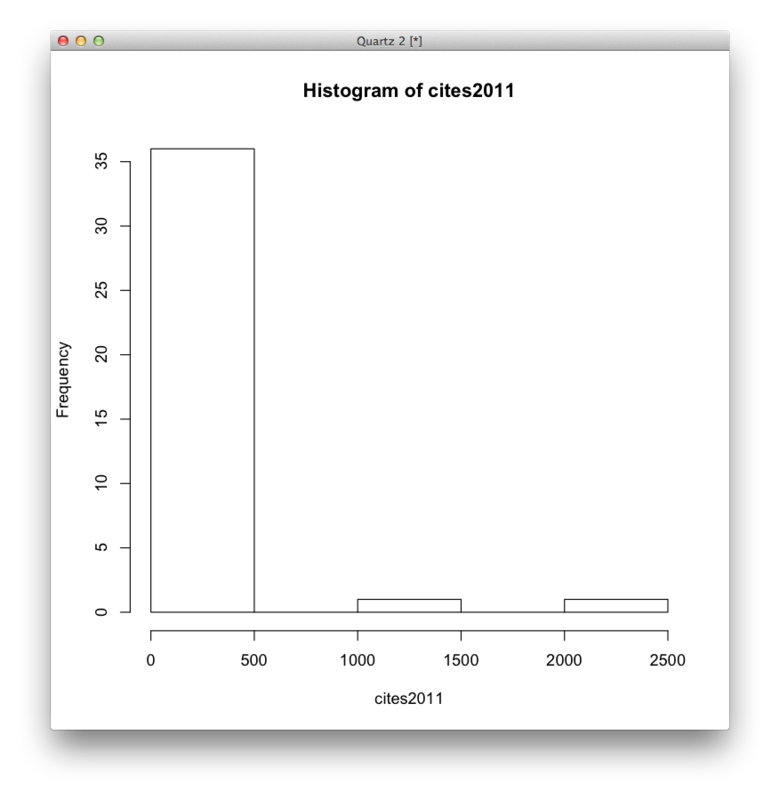 What can be learned from it, at least as a first approximation, is that the same steps are unlikely to catch that thing. This is why cryptozoologists persist. They can’t be proven wrong. You can’t show them that there is no Sasquatch. Most people, given enough negative evidence, will generalize that a statement is false and move on. Most of us believe there is no Sasquatch. We believe that there is no Sasquatch because people try and fail to capture a Sasquatch over, and over, and over. Those failed attempts to capture Sasquatchii, then, have a little bit of value to everyone. This is why the scientific community would like negative results published: because we can still learn from them. Some more (great, obvious ideas that should work but don’t), and some less (stuff that ends published in the Annals of Improbable Research). Even if there are errors, and omissions, and mistakes, we should still learn from our work. But who’s going to curate, collect, peer-review, and publish all that? Writing stuff up for publication is a lot of work, and reviewing is thankless, unpaid, and a lot of work as well. But here’s the thing: we self-censor everyday negative results. We don’t send them out for publication, we don’t bother too much with them. We might as well just put them on the Internet, and let people quote and cite and learn from, or ignore, them as they will. What if there’s a great idea there, and someone takes it from me? Well, I hope that humanity benefits, for one. I hope that they credit me, if they took my idea. And I hope I’m not so conceited as to think that I have many great ideas. A few good ones, I hope. So I’ll start posting stuff I do here. It will be (hopefully) interesting, (perhaps) thought-provoking, (potentially) flawed, and unfit for regular academic publication. At least for the time being. If you like it, let me know. If you use it, please credit me – I am, after all, an academic, and need credit. If you improve it, or fix it, I’d love to know about it. If you don’t care about it, ignore me.